Daniel Chavez-Bello is David Bouley’s second of cuisine at Bouley in New York City. Born in Spain, Chavez-Bello has worked for some of the world’s most acclaimed restaurants including Mugaritz, El Bulli, Can Ravel, Martin Betasategui, Ritz Barcelona, and Helene Darroze in Paris. Below, Chavez-Bello introduces us to a classic and authentic dish from Ribera del Duero: lamb and pisto. Bouley sommelier Arthur Briand (above) works across all restaurants in the Bouley portfolio. 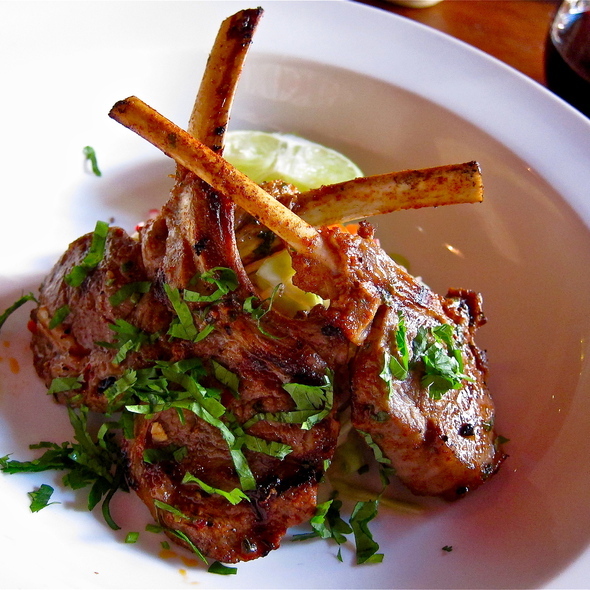 He recommends pairing the lamb with a bottle of 2010 Emilio Moro. The wine’s has intense aromas of mature, ripe blacks fruits and well-balanced toasty touches. Powerful on the palate, it is full, meaty and rich with thick black-fruit tannins, vanilla, balsamic and spicy touches from fine quality oak. The finish is long and full. Briand says it’s a perfect match. Bodegas Emilio Moro has a rich history in the Ribera del Duero region, producing wine for over 120 years. Why Ribera with lamb? Wine Folly explains that tempranillo is made for it. “Lamb is a lot more delicate in flavor than most beef … lamb also really takes on the flavor of the sauce, so consider the sauce when pairing. Opt for more medium-bodied wines or bold reds with smoother tannin.” Read More From Wine Folly here. Serve for four people as a main course. Step 1: Marinate the racks of lamb in white wine vinegar for an hour minimum. Step 2: Brunoise all the vegetable for the pisto. Step 3: Remove the lamb from the marinade. Add olive oil, rosemary, garlic and thyme. Be careful not to dry the meat after taking it out of the marinade. Step 4: Preheat oven to 340 degrees Fahrenheit and cook the lamb for ten minutes. Step 5: Decrease the oven’s temperature to 265 degrees Fahrenheit and cook the lamb for 25 minutes. Step 6: Put olive oil in a pan, and add the brunoised vegetables and some salt and pepper. Add all the herbs on top. Let it cook by itself without stirring so that you don’t break the vegetables. Cook for 25 minutes. Step 7: Take the lamb out of the oven and let it rest for 10 minutes. Add salt and pepper. Step 8: Prepare the plate. Put the pisto on the plate and the three racks of lamb on top. About the Sommelier: Arthur Briand has been one of David Bouley’s sommeliers since April 2014, working across all of his restaurants. He has been mentored by top French sommeliers including Manuel Peyrondet, Marco-Antonio Sassi and Adrien Falcon. More about the Bouley restaurants here.